The goal of everyone, who takes his craft seriously (especially in the art world) should be to get featured or write for a magazine that is completely aimed at professionals. 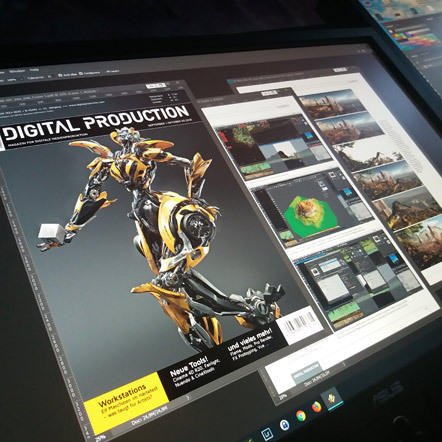 I have written for magazines in the past and while they were surely aimed at professionals as well, none of them were quite as focussed as the german ‘Digital Production’ magazine. So yeah, I can scratch something off my to do list when it comes to my artistic work. I had the pleasure to write a six page article about Vue and how it works. An introduction basically. It was a lot of fun to talk about the tool and how I use it. Using my ‘Memories Of Ascalon‘ piece to explain my workflow a bit. If you are fit in german language then I can only recommend this magazine. It’s completely aimed at VFX and CG stuff and a quality read. This entry was posted on Tuesday, August 28th, 2018 at 20:11	and is filed under Publications. You can follow any responses to this entry through the RSS 2.0 feed. You can leave a response, or trackback from your own site.